I created a box template to hold Love Notes (3"x3" cards). 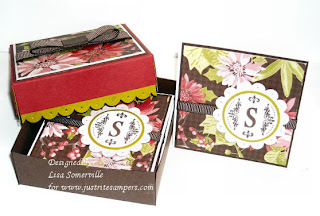 The box and love notes shown here, I've created for a contest that Just Rite Stampers is running. I used my C-30 Monogram Stamper Kit for the monogramming. The card stock on my love notes is the new Holiday Treasures designer series paper from the Fall/Winter IB&C. ETA - Box Base is 5-1/4" x 5 1/4" score at 1" on all sides. Lid is 4-15/16" x 4-15/16" score at 3/4" on all sides. Wow! Lisa this is resplendent! Good Luck! Great card Lisa! I have the C-45 and I'm having the hardest time stamping a nice clean image...any tips?? I'm going to have to go back to their website and see what they say but I played about an hour with it and not once got a good image. And on top of it the little letters I got didn't even stamp...bummer!